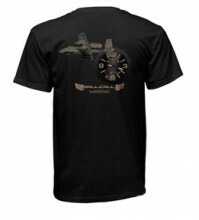 STØLÅS Watch Co. Warthog T-shirt, Grab the attention of others! Click the button below to add the Warthog BallCall Tee to your wish list. Grab yourself a hot STØLÅS TEE! This T-Shirt features the awesome BallCall Warthog. With the STØLÅS Pelican up front in the Warthog sand color and on the back the Warthog itself, both watch and plane. This shirt will grab the attention of those around you. This shirt is 100% cotton and machine washable.